The 26-year-old Mexican driver of a cucumber-toting tractor-trailer was arrested after agents on Saturday at the border station in Nogales discovered the fentanyl in a secret compartment, U.S. Customs and Border Protection officials said. 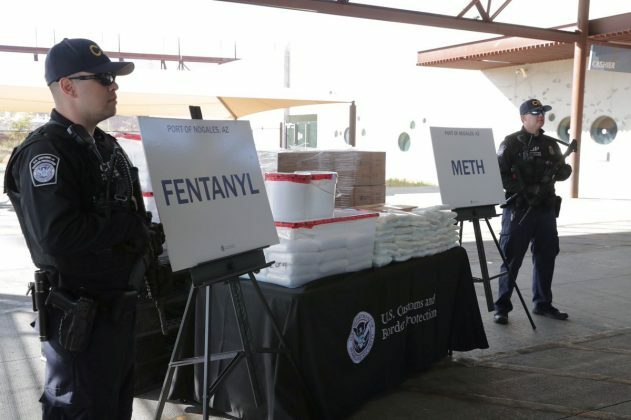 The fentanyl was worth an estimated $3.5 million, based on valuation criteria of the U.S. Drug Enforcement Administration, Hugo Nunez, a spokesman for U.S. Customs and Border Protection, said in an email. “Fentanyl is trafficked into the United States largely from China and Mexico but it is not possible to determine which country is a bigger supplier, the DEA said in a report in October. This entry was tagged Arizona, Border Crossing, Mexico, Opioid, opioid crisis, painkiller, U.S. border agents. Bookmark the permalink.